A promising engagement for the American foreign policy mechanism could be the newly reestablished Quadrilateral Security Dialogue (also known as the “Quad”) that would be successful touching not only upon international threats like terrorism and nonproliferation, or the prevention against the spread of nuclear weapons but also regional, geopolitical issues as well, like North Korea. The cooperation would make it easier for the United States to manage conflicts with global impacts like the maritime issue in the South China Sea, and to regain America’s influence, power, and reputation in the world’s most dynamic region. 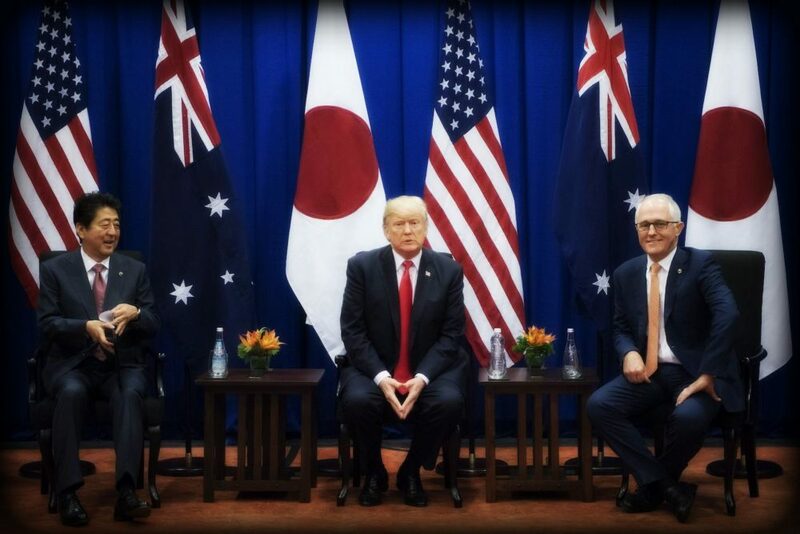 The Quadrilateral Security Dialogue is a formal cooperation between Asia’s top democracies (India, Japan, and Australia) and the United States, with a goal to maintain a “free and open Indo-Pacific” while also providing maritime security, uphold international law and boost cooperation. However, the last decade saw many significant changes occurring in the region’s balance of power, such as, most importantly, China’s ascent as a power-seeking regional hegemony (with aspirations to be the most influential and powerful country in the region, both economically and military) with global potentials. This urged other members to reestablish the dialogue and meet up in Manila last year, where the respected countries senior officials have placed the dialogue on new foundations and rules. The Quad’s origins date back to the 2004 December Indian Ocean earthquake and tsunami, where nearly 250,000 people died in over 15 countries. These four countries were the most active, contributing with over 40,000 troops, and humanitarian responders, to assist the affected countries. After three years it was the idea of the Japanese Prime-Minister Abe Shinzo to form a quasi-regional cooperation among the four countries which focuses on regional security, holding naval exercises with Singapore. Nevertheless, the cooperation didn’t last long. As China’s antipathy raised, the members estranged from each other. Back in 2008, the newly elected Australian Prime-Minister Kevin Rudd pulled Australia out from the dialogue in order to maintain its crucial economic relationship with China. The emerging influential potential of China in the region’s affairs could result in a decrease of the American moral presence and it could likely make it less effective for the American foreign policy system to take action. The vendetta here concerns here whether or not the QUAD dialogue is a right way for the US to balance China’s escalating power and get involved again in Asian affairs as it was after the Cold War, or will it consider, and possibly, confront China as a true enemy? In this case, America’s national interest faces national security. Being involved in the QUAD boosts cooperation in the region under American auspices, which represents the country’s national interest, however risking America’s national security by facing China via dialogue, could result in a more offensive and aggressive confrontation to the US. Already in the Chinese media, the Quadrilateral Security Dialogue is interpreted as a threat to their country, saying that the dialogue’s ultimate purpose is to encircle China and to stop their economic and military rise while spreading its influence in the South China Sea, and along the Indian Ocean. Although, for now, it seems that the Quadrilateral Security Dialogue is serving as a consultative mechanism, where members can state their core interests and ensure support if those interests are threatened. Looking at the Indo-Pacific policy of the Trump administration, a pro-India approach is on the rise. Already in 2016, Barack Obama assigned India as a “major defense partner”, while New Delhi signed security agreements with Australia and boosted the Indian-Japanese relations. The term “Indo-Pacific,” is getting used more commonly in the last years, promoted by the member states in order to highlight the importance of India and raise their status in the US foreign policy mechanism. This outwits the fact that the traditionally used “Asia-Pacific” terminology suggests an East Asian region as a geopolitical “playground” where just the United States and China are the major sides. It complicates the situation that China is the most important economic partner of three out of four members (Australia, Japan, and the United States). More than likely neither India and Australia will renounce to their significant economic relationship with China. The United States already started a Trade War with China for its trade imbalance. This makes it more essential for the US to strengthen the dialogue, but at the same time makes it riskier to not remain alone in front of an anti-China coalition. Currently, it’s still not clear, what are the real incentives of China to launch the Belt and Road Initiative, which involves a big part of Asia and Africa. In addition, constructing artificial islands along the South China Sea, violating international rights of sovereignty. The United States has to deal with a double sided issue. From one stance, the United States has to get involved into stronger ties with Quad members in order to maintain the good American moral presence and to have (if not) an unquestionable position, but a strong one to pursue their goals. On the other hand, America has to worry about a possible change in China’s foreign policy strategy into a more aggressive one if the US takes the required steps to boost their presence in the region. The reestablishment of the Quadrilateral Security Dialogue was a good decision and a significant step towards an American headed regional multilateral cooperation. Because, we are living in a time when American President Donald Trump is pulling out from several regional economic cooperations (like the Trans-Pacific Agreement) and a time when everybody is paying attention to China’s increased power, the Quadrilateral Security Dialogue, and conversations between Asia’s greatest democracies, hopefully, the gap can be bridged and American can maintain it’s influence in the Asia-Pacific. If there is a real “China threat” in the region, the Quadrilateral Security Dialogue will deepen, and if that happens the United States is on a path to fight back against China. Therefore, China will have no choice but to find a common solution with the United States in order to prevent a regional “anti-China” blockade of sorts. Profiting from the fact that America was involved in several wars and conflicts, like Iraq or Afghanistan, that boosted Anti-Americanism, this gave China the chance to form stronger diplomatic positions with countries such as Russia, Iran or some African countries that felt pressured by the American Hegemony in the 1990s. Despite all the challenges that the cooperation faces, the Quadrilateral Security Dialogue represents the willingness and a new American foreign policy approach toward the “Indo-Pacific”. This episode features a discussion between Andrew Shearer, Michael Green, and Amy Searight on U.S. alliances in Asia: https://soundcloud.com/csis-57169780/ties-that-bind-episode-2-trump. Jesse B. Gale and Andrew S. (March 2018) – The Quadrilateral Security Dialogue and the Maritime Silk Road Initiative. CSIS Brief. George Galdorisi (January 18, 2018) – National Security Strategy of the United States (2017 December). Ahmed Rashid – “After 9/11, Hate Begat Hate – The New York Times.” Accessed November 13, 2018. https://www.nytimes.com/2011/09/11/opinion/sunday/and-hate-begat-hate.html.